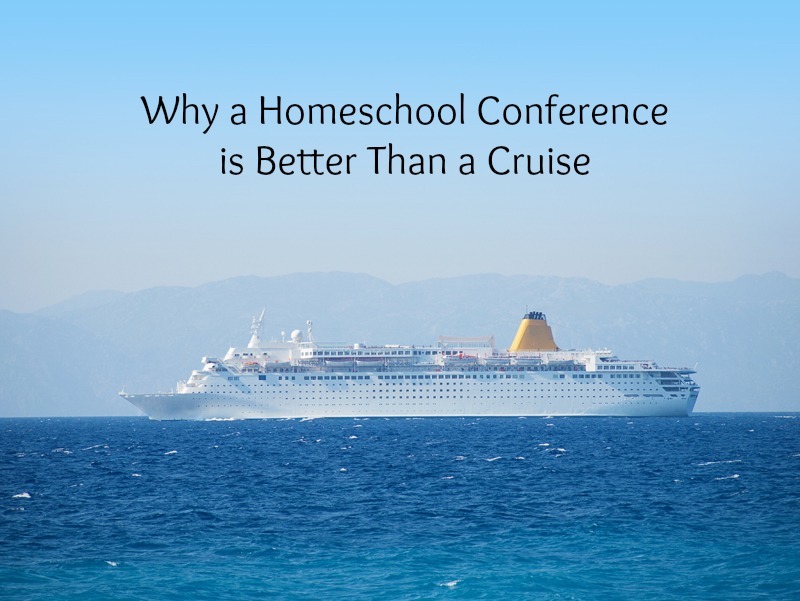 A Homeschool Conference is Better Than a Cruise! I remember the year my husband and I were fortunate enough to be able to take our first cruise. Homeschool Adventures asked Maggie to be a speaker at the homeschool conference they were holding on a Carnival’s cruise ship. I had long before thought of having a homeschool conference on a cruise ship, and I told Maggie that she and Bob weren’t allowed to go without us! I was pretty desperate for a vacation, and I loved every moment of it. In Mexico we saw ruins. We snorkeled for the first time. The whole thing was a blast. Of course, even if we’d just sailed around the water on the ship, I’d have been happy. Everything you’ve ever heard about the never-ending, yummy food on a cruise ship is true. Because I was in my first trimester of pregnancy, I took full advantage of having great food and not having to prepare it. I truly had the time of my life. However, I spent most of it trying to figure out how I was going to stow away and stay on the ship or how our lives could be rearranged so that we could sell all our stuff, get jobs on the ship, and homeschool on the ocean. As you read this, you probably laugh, thinking I’m kidding. I was not kidding. I was desperate. I did not want to go home. I did not want to face those whiny children. I did not want to play the “Do we have to do school today?…Why do I have to do math?…But I hate science!” game again. Fortunately, I could never figure out how to pull off my stow-away plan, and I ended up back at home, homeschooling again the next week. Fast forward to March. I began planning a trip to our state homeschool conference, four hours away. My friends had never been and weren’t sure they wanted to go. I had to beg. Hard. I had to pray. Hard. I thought I was going to end up going by myself. But a couple of weeks before the weekend arrived, we had eight gals going. And from the get-go, we had a blast. Even the drive was invigorating We shared our issues, our struggles, and our successes. We reminded each other why we homeschool. We reassured and suggested. We comforted and commiserated. We all went out for a yummy dinner where we had a huge table and shared our favorite moments of the day. we went back to the hotel and stayed up late, sharing our purchases and bargains and coming up with a game-plan for the next day. After eight more hours Saturday, I was ready to go home. I couldn’t wait to see my children, to hug them, to tell them I loved them, and remind them that we love them so much that my job is to stay home and teach them. Why was my state homeschool conference better than a week-long cruise? I came home with a plan. I came home with ideas for how to make next year (next month and next week) better. I came home with the reminder that it is only by God’s daily grace and by continual leaning on Him that I can get up each morning and spend the day trying to stay a step ahead of my kids–be witty, take advantage of teachable moments, discipline appropriately, and enjoy these precious gifts that God has bestowed on us. I came home with hope. My best spring advice? Plan now – even if it’s last minute – to get to a homeschool conference this year.